Grade: AISI 304, 304L/304 LER, 308/ 308LER, 309/309LER, 310/310ER, 316L/316LER, 312, 314 & 430L etc. Our company has earned accolades in offering 309L MIG Wire. We are offering Stainless Steel MIG Welding Wire to our client. With the assistance of our skilled professionals, we are offering a quality approved array Stainless Steel Mig Wires. The Stainless Steel Mig Wires we offer is known for their corrosion resistant nature. Offered products are highly demanded for their hassle free performance. Romero STAINLESS STEEL MIG WIRES ARE SUPPLIED IN BRIGHT AS WELL AS IN MATTE FINISH. THE WIRE IS SPECIALLY CLEANED TO AVOID WELD CONTAMINATION. SUPPLIES CAN BE BOTH MADE IN PLASTIC SPOOLS, AS WELL AS IN METALLIC BASKETS. THE WIRES HAVE SUITABLE CAST / HELIX TO ENSURE PERFECT "PAY-OFF. We manufacture and supply world class Stainless Steel MIG Wires that are made from high grade Stainless Steel that ensures high strength and durability to them. The corrosion and oxidation resistant nature of the S.S. MIG Wires, supplied by us, have placed us among the leading S.S. MIG Wires Manufacturers, Suppliers and Exporters from India. 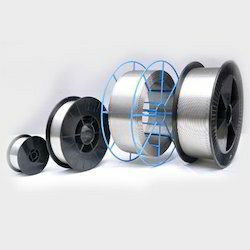 - 12.5 Kgs/ 25 Lbs, 15 Kgs/ 30 Lbs/ 33lbs Layer Wound Plastic/ Metallic Spool. We are leading manufacturer of Stainless Steel MIG Welding Wire. Please feel free for any requirements. We are offering 309 Stainless Steel TIG Welding Wire.